A problem with extra words can be caused by graphics in your .pdf file. AnyCount’s word count engine will count every graphic element as one word. 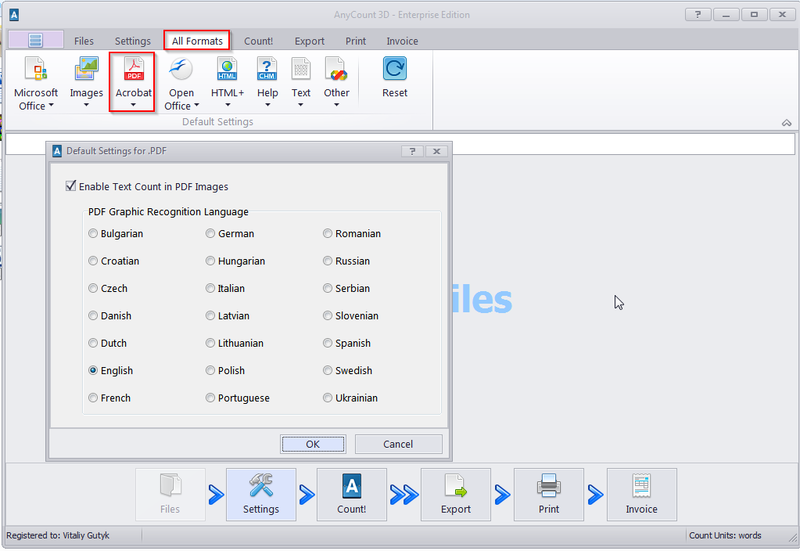 Thus if your .pdf file is recognized, then the ‘PDF Graphic Recognition’ function should be disabled. You can access the default settings of this file format, by selecting All formats > Acrobat > PDF in the ribbon. 1. Avoid all signatures, pictures which do not contain text and stamps. Erase all such objects in your unrecognized documents to get fully right results. 2. If you have pages in documents which have rotated text, please, rotate these pages to establish normal view of it. Pages with rotated text will be counted incorrectly. 3. Resolution and quality of images in .PDF files influence on quality of these files’ counting largely. So, make sure that you have a normal resolution and quality of pages of your unrecognized PDF file.